6. At end of row the last stitch can between tricky. The entry is a bit tight. See circled stitch below. For the past few months I have been carrying a project bag in my purse. Harper is now 5, so after school pick up we usually head to the playground. She plays, I sit and crochet. Also, this uses up small amounts of yarn and is a small enough project to carry around. I’ve been using organic Blue Sky worsted cotton. It’s incredibly soft not to mention eco friendly. So if you want to make someone a housewarming gift or new baby gift these cloths are perfect. They make great wash cloths, so soft on the skin and feel so durable. I use a few for my face cloths, Harper uses some in her bath and now I am making crocheted ones for the kitchen. Ok so THE CONS: I do realise that sometimes a knitted or crocheted cloth won’t scrub like a sponge. It may not provide the scrub one needs on a soup caked pot. For that I will use my spaghetti scrub that I mentioned in my last post. Another CON: at first I had a hard time using nice cotton for the kitchen, but honestly it’s nice because it’s durable, good for the environment and fair trade. So I should just get over myself and use the beautiful cotton yarn. I bought the yarn for these reasons. 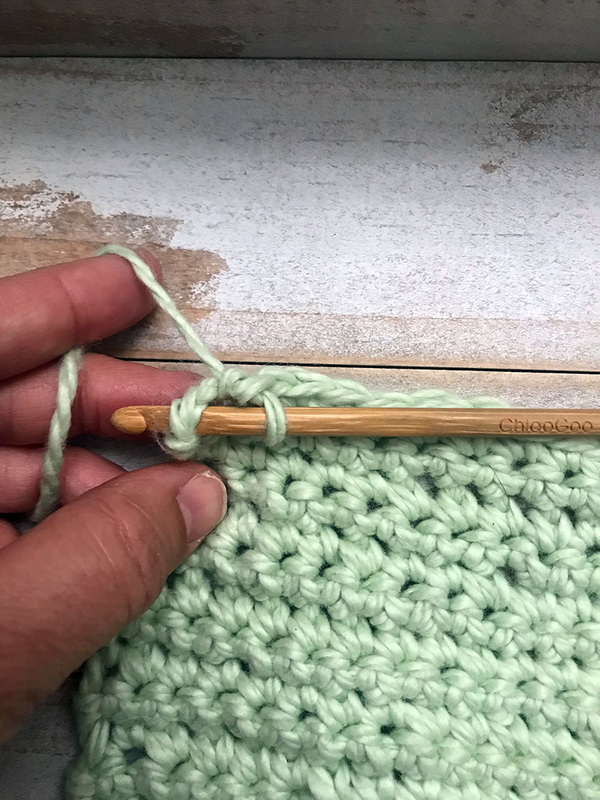 I experimented with a few size hooks, the same yarn and the same pattern with a little variation for size of the cloth. I used 2 hooks, a size J, 6” by Addi and Chiao Goo bamboo hook in 5.5 mm. 1. Make your foundation chain of 26 stitches. 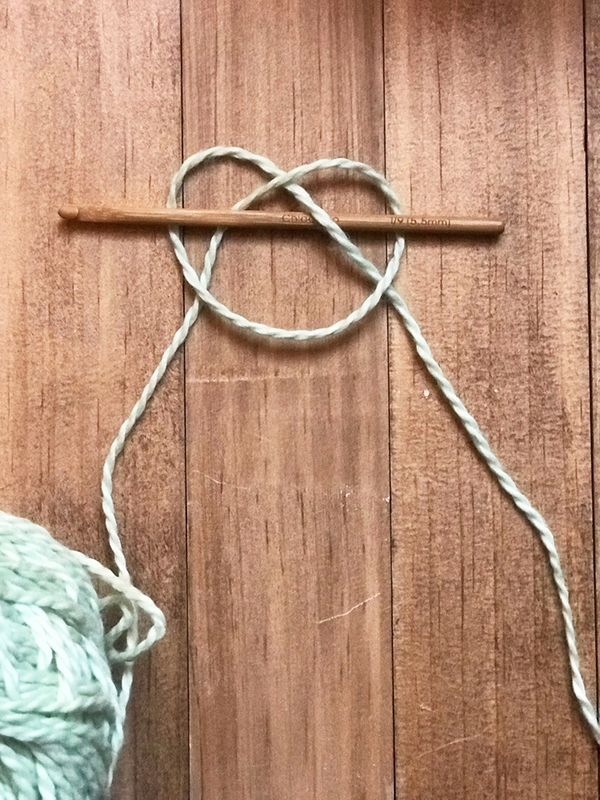 Make a slip knot with your yarn, looks like a pretzel. 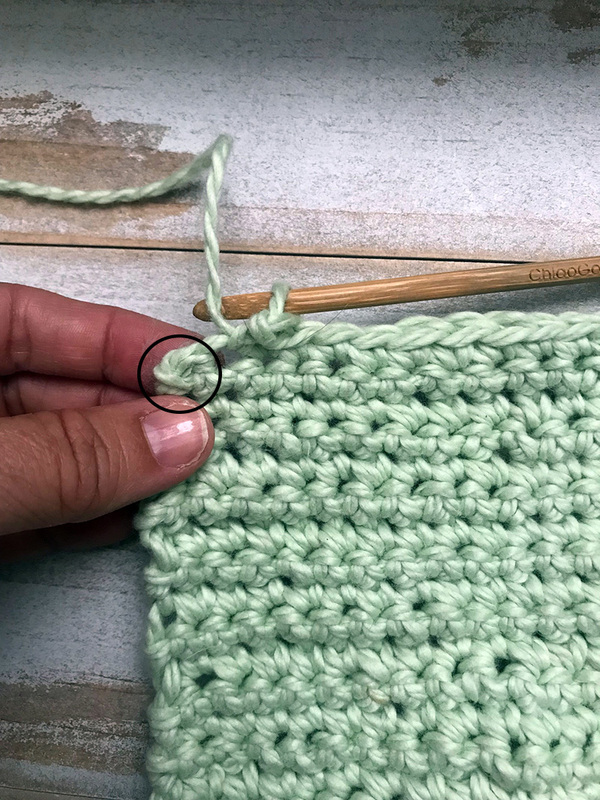 With your right hand pull the yarn tail over the rest of the yarn, create a loop. The left side lays on top of the yarn and the tail part will lay under the right side of the pretzel. 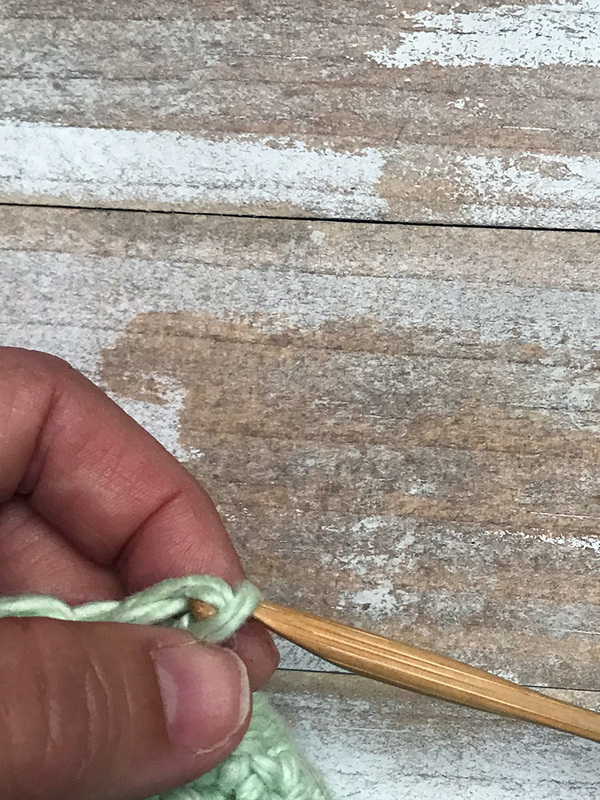 Make your slip knot, notice that the tail right side is under the yarn. Step 2, slide hook into pretzel knot. Pull slip knot on hook by pulling the two tails. Slip knot hugging your hook, time to start the chain. Starting the chain. With your left hand, ring finger and thumb hold the slipknot, the yarn is over your index finger. 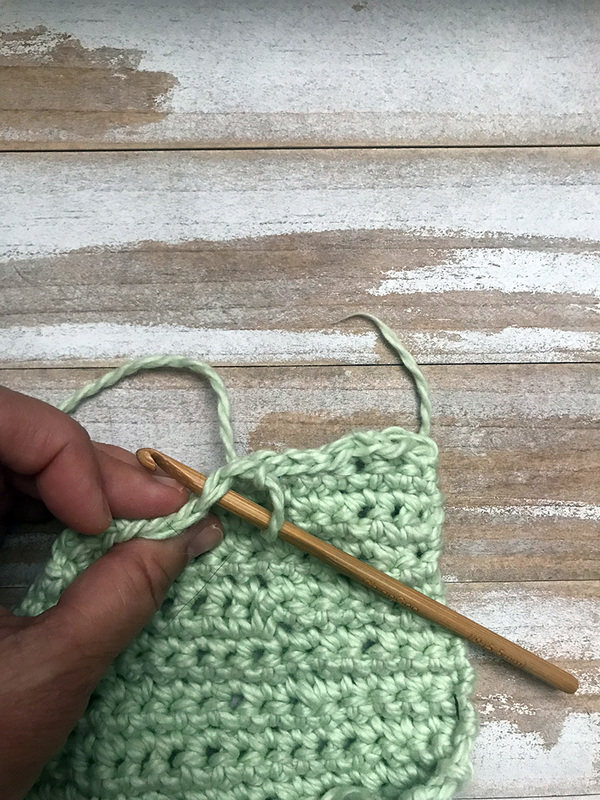 With your right hand, hold the hook and the yarn on the hook. 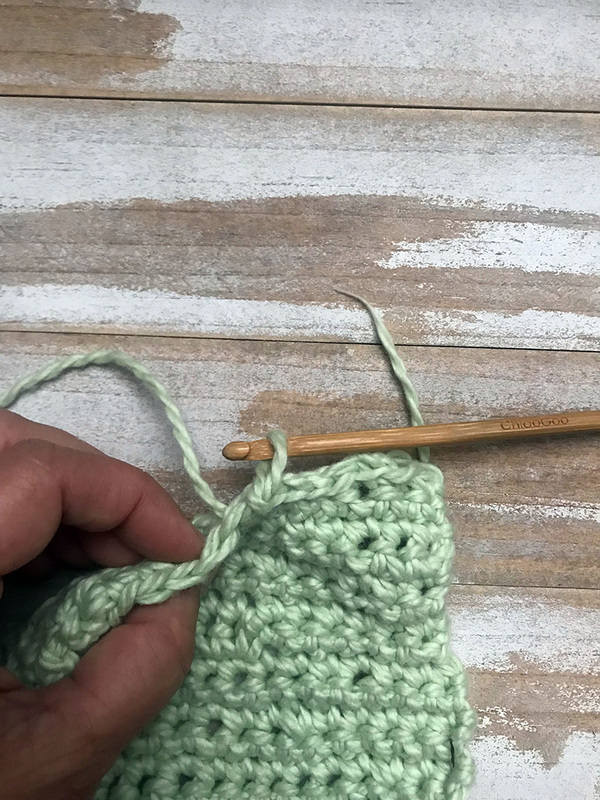 Wrap yarn over (yo) and under the hook, then slide loop that’s on the hook over the tip and the yarn you just wrapped over. This is one stitch of the chain stitch. Continue this for 26 stitches. I have done the sample in green but the actual cloths I made are in white and pink. After chaining 26 it should look like this. In the next post I will continue to show you the pattern of making the dishcloth. How often do you Throw out your Kitchen Sponge? twist sponge, one of the better and safer ones. loofah on top and sponge underneath. Do you use a sponge in your kitchen? How often do you replace it? I’ve heard kitchen sponges are harmful, for us and the environment. When I started to read up on it, oh wow and very gross. One, the unfriendliness to the eco system and two, the bacteria that sponges hold. So much dangerous bacteria that people who have an illness already can become more sick. NY Times has a very enlightening article on the bacteria that you can read here. So yea sponges hold a lot of bacteria and using the microwave or dishwasher to clean them doesn’t work. So we humans came up with anti-bacterial sponges. Yay! No…. Once again humans are trying to make life easier but is harming the environment as a result. Sponges are made of plastic and have a chemical called Triclosan. This is registered with the EPA as a pesticide. It destroys fragile aquatic eco systems especially algae that other animals may depend on. So you have a sponge that is “anti-bacterial”. It tells you on the packaging. How often do you replace your sponge? Some replace once a week, we replace ours when it’s pretty exhausted looking. So it gets thrown out, makes it way to a landfill or waterway. Because it is anti-bacterial, sewage and waste water treatment plants can’t remove it. As of 2009 it is one of the main chemicals found in US streams. I learned this on greenlivingtips.com a very good website on eco issues. Another negative of the kitchen sponge is that sponges are made of plastic and as you know plastic doesn’t break down. You can buy a cellulose sponge. Cellulose sponges are made from 100% organic or bio-degradable materials. Cellulose is sourced from plantation forests or recycled. If you buy a cellulose sponge be sure to read the packaging to make sure it was not impregnated with polyester, another form of plastic. Cellulose sponges do break down and pure cellulose resists bacteria. Wood brush: great for cleaning those tough jobs, made with a wood handle and natural tapioca fibre bristles, with a replaceable head. The online store, Wild Minimalist, carries an awesome selection of supplies to make a zero waste life. Another alternative is making your own. 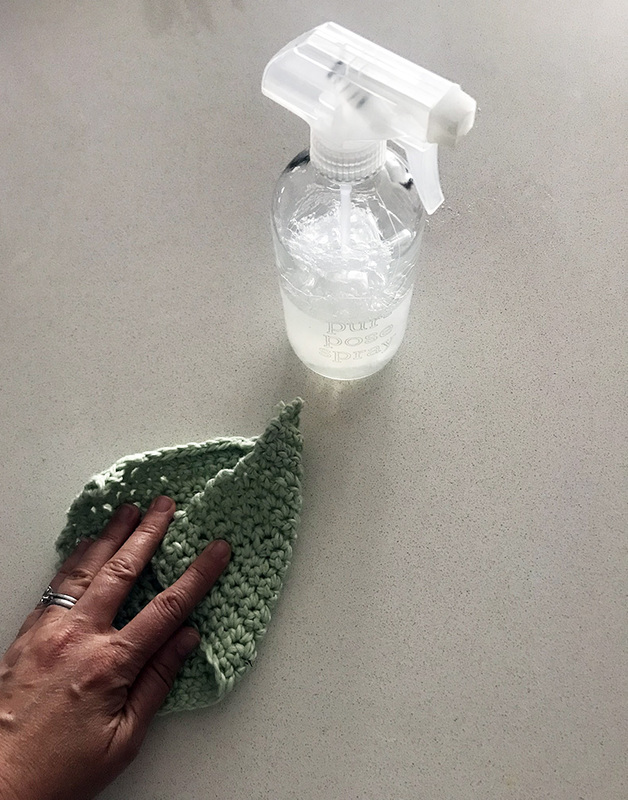 In my next post I will show you how to easily whip up your own kitchens scrubbers while on the go. I receive no payments or products for the businesses I mention. My opinions are thru my own experiences.